Hot, humid nights call for ways to cool down, and this is the perfect way to do so! This is a treat for the grownups. 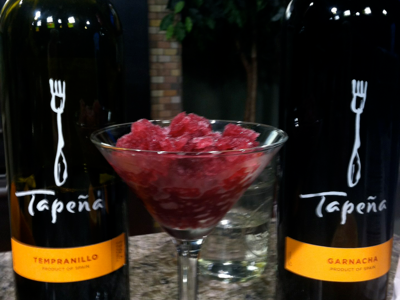 Take your red wine and add some orange juice and simple syrup then freeze to make an icy, cool treat! Mix all ingredients together then pour into a 9x9 dish. Place into freezer and after two to three hours, begin scraping with a fork, for an icy texture. Return to freezer for another two hours, at least. Use an ice cream scoop and place into martini or wine glasses to serve. Serve with an orange wedge and mint sprig.